Bressert, Part II: A second colleciton of sweet breakfast recipes from Distinctive Inns of New England. Last week we started our series about sweet breakfast treats. We’re not sure it’s original, but we coined the term “bressert” to refer to that wonderful beginning of breakfast served at the 12 Distinctive Inns of New England (DINE). For those who love a sweet treat to begin the day, fear not. You’ll always find something to feed that sweet tooth at breakfast, along with the perfect surroundings for your romantic getaway too. It’s no accident that our acronym is DINE. Stay at any of the DINE inns and you’re sure to leave relaxed, rested, happy and full of sweet memories. We have so many great sweet additions to your breakfast, we simply had to extend this series about “bressert” recipes into a multi-part series. Here are a few more recipes for you to try at home, or better yet, schedule your DINE getaway soon and let us do the baking. Mix together dry ingredients to smaller mixing bowl, mix well & set aside. Add remaining “wet” ingredients to larger bowl, blend until smooth and then add above dry ingredients. Fold dry ingredients into wet batter. Important, do not over mix. It’s ok to have large ½” lumps in batter. Let batter sit for 15-30 minutes before using. Turn Waffle Iron on and set to highest setting “Crispy”. (Waffle Iron heats up in approx. 5 minutes). Pour just under ½ cup batter into each 4” square. Note: batter spreads and rises, so you don’t want to overfill your waffle iron squares or batter will come out the sides. Sprinkle approx. 1 Tablespoon Choc Chip Morsels over each waffle before closing waffle iron. Cook until steam evaporates (approx. 3-4 minutes). Top with sliced Strawberries, Whipped Cream and finish by drizzling warmed Nutella or Choc sauce overall. Mix the sugar, oil, and eggs. Add the zucchini and vanilla – mix well. Sift the flour, cocoa, salt, cinnamon, baking soda, and baking powder. Mix into the wet along with the chocolate chips. Pour batter into loaf pan and bake for 40 minutes, turn and bake for about 20 more minutes. Or until toothpick comes out clean. 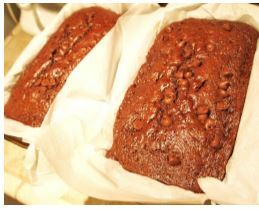 Carefully remove from pan (using the parchment to help) and cool on a cooling rack. 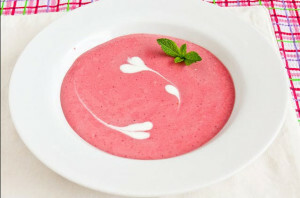 Combine sour cream, strawberries, honey and vanilla. Blend in food processor until smooth. Garnish with fresh mint and serve cold. Note: This is one of the easiest recipes you can find, yet it’s a wonderful way to start the day. It’s kind of like a smoothie in a bowl! Stay tuned for more sweet recipes in next week’s blog when we focus in on different ways to create the perfect donut in your own kitchen. Better yet, leave the baking and clean up to DINE, and plan your next romantic getaway at the 12 Distinctive Inns of New England by clicking on links below that will take you directly to each of their websites. Then, start your day with sweets along with your sweetheart. 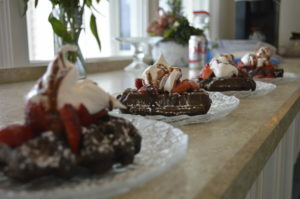 This entry was posted in Cliffside Inn, Distinctive Inns of New England, Inn at Harbor Hill Marina, Rabbit Hill Inn, Recipe and tagged breakfast recipe from Cliffside Inn, breakfast recipe from Inn at Harbor Hill Marina, breakfast recipe from Rabbit Hill Inn, bressert recipes, chocolate breakfast recipes, delicious breakfast recipes, DINE recipes, New England innkeeper breakfast recipes, sweet breakfast recipes, sweet breakfast recipes from New England innkeepers, sweet recipes, sweet treats for breakfast from DINE innkeepers by DINE Blogger. Bookmark the permalink.